Grizzly bears on caribou carcass, Denali National Park, Alaska. So here’s the reason why the bus that I thought would take me to the park entrance (see this post). I got on the bus and heard the driver talking about ‘wonder if the wolves would still be there’. Immediately perked up, leaned forward, and eavesdropped my a** off. Turns out a pack of wolves had killed a caribou bull not far off the road, and the whole pack had been feeding all morning whilst I was walking around the backcountry chasing some stupid moose. I finally start to get this story, thru the bits and pieces I could overhear, as the bus pulls into Eielson visitor Center for a scheduled stop. Now, I know the bus drivers have a schedule to keep, but if there’s a wolf pack feeding on a caribou carcass down the road, IMO schedules ought be abandoned. Apparently the bus driver didn’t think my opinion counted for much, and we had to sit in the Visitors Center for 45 minutes, in order that we departed at the ‘correct’ time. Then we had to stop again at the Toklat rest stop for another 20 minutes, and 15 more at Polychrome. So, sure enough, by the time we arrived, the wolves had vacated the carcass, and a grizzly bear sow and her 2 cubs were now in charge. In what was possibly the luckiest moment of my life (after meeting Eric Clapton, years earlier, of course), I convinced the bus driver to let me off the bus so I could stay and photograph. Normally bus drivers in Denali Park won’t let anyone off the bus within a half mile of a wildlife sighting, and a mile of a bear sighting. A bear on a kill, no chance, right? Ask, and thou shall (sometimes ) receive. I think it was my trusting good looks, delectable personality, delightful’ smile and downright charmin’ aussie accent that won her over. So I get to spend nearly 3 hours watching and shooting these bears on the carcass. I only left because I had to catch the last bus out of the park and then drive to Anchorage, pack and leave on a trip the next morning. Well, that and it was dark and snowing. It was an awesome opportunity, and a thrilling experience to see the bears here. The wolves were howling from across the river, in the brush, but the bears paid them little heed. It was interesting to me how different it was, for me, to watch the bears feed on a caribou carcass than it was for me to watch bears feed on salmon carcasses, at places like Katmai National Park. The process of life is really the same whether the ‘prey’ is a fish or a mammal, right? Wrong! Not if you’re at all human, in my opinion. For whatever reason, it sure feels different to me (and probably for the caribou, too 🙂 ). So, I got to Anchorage late that night, but got packed and left on time in the morning. And you know where I was leaving for? Brooks Lake, to photograph grizzly bears! I do love me some bears! So with the previously posted moose photos, and then this experience, I would definitely rate this as one of my all-time favorite photography days. Here is a link to all my Grizzly Bear Photos online. This entry was posted in Alaska, Cool stories, Denali National Park, Grizzly Bears, Wildlife on October 12, 2008 by Carl D.
I remember this story well! I think I heard it as soon as you hit cell range – for good reason, what an amazing experience and wonderful image! Hey Carl, I am sure it was your good looks & Aussie charm ;that you were able to get off that bus!! You know, I know how you feel about watching that bear on a caribou carcass. I love my bears, thay are beautiful animals & make the wilderness what it is. But I remember the video I just saw on CNN, where a grizzly took a moose calf down. It was sobering!! I felt so bad for the moose calf.It’s a wonderful pic, but nonetheless sobering. So take care on your trip to Brooks Lake. I know you’ll get us some fantastic pics!!! P.S. Hey Ron!! Looking at your wonderful pics too!! P.P.S. Carl, did those bears see you, because it looks like the cubs are looking at something very intently? Wow, Carl! This is one powerful image. Not only is the subject matter very dramatic, but the image is perfectly composed. 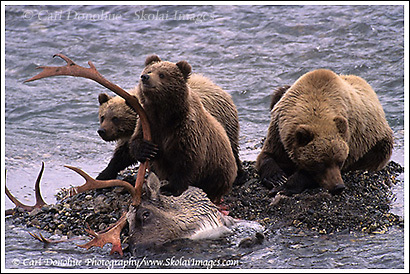 I especially like the contrast between the happy bear family vs. the tragic sight of the caribou’s severed head. Send this one to NGS! Thanks man, I appreciate that. It was a pretty memorable experience for me to witness. You should send the shot to Clapton and let him know he is still right up there. Powerful is exactly the word that came to my mind in seeing this, but Guy beat me to it. Probably a once in a lifetime moment to have a scene like this – no wonder you are fond of the memory and getting images to savor to boot. In nature, nothing is ever wasted! I don’t think Guy will mind if you repeat a word he used. 🙂 He’s sure got a lot of mileage out of one I used recently. The bears look adorable in these photos. Great shot!